A piratebox is a small computer, WiFi adapter, and a hard drive. The idea behind the piratebox is to simply put some storage on a network, accessible to all. It’s great if you’re in a group, need an easy way to share files at the hackerspace, or just want to put a modern twist on a LAN party. [Nick] and [Josiah] came up with their own twist on a piratebox, and this one uses a Raspberry Pi Zero W, making it one of the cheapest pirateboxes around. The Raspberry Pi Zero W, with its network adapter, has all the hardware required to turn into a capable piratebox, so the hardware for this build is pretty simple. It’s just a USB A plug in the form of a USB Stem and nothing else. The software is available on GitHub and broadcasts a WiFi network named SUBZero. Browsing to 192.168.1.1 on this network allows for uploading and downloading files, all without an Internet connection. It’s a cloud that will fit in your pocket, which we’re calling a ‘fog’ or a ‘mist’ this week. Since this is called the ‘SUBZero’, perhaps ‘pogonip’ is the preferred nomenclature. Of course no Raspberry Pi project is complete without a 3D printed case, and the SUBZero is no exception. There’s a 3D printed case for this Pi Zero, complete with a sliding door for access to all the ports. You can see a video of that below. The enclosure for the device is a three bay hot-swap HDD module, with one of the bays gutted and used for the Banana Pi. It’s a simple idea, elegantly executed, which looks great. To access the ports of the Banana Pi, a custom acrylic side panel was laser cut, which also allowed LEDs to shine through – obligatory for any DIY server/computer build. When mounting this panel to the existing enclosure, [Blake] was reluctant to take his chances tapping the brittle acrylic, instead opting to melt the threads into the plastic with a pre-torched screw. We find that tapping acrylic is usually okay if you take it slow, but heat-tapping does sound fun. The 12 V fan that came built into the hot-swap enclosure was too loud and awkwardly came in a non-standard size with a non-standard connector. What’s more, a buzzer alarm was triggered any time the fan was disconnected and 0 RPM was detected. [Blake]’s solution was to rewire the power pin of the connector to a 5 V rail; he found that running the fan at 5 V led to much quieter performance whilst keeping the HDDs sufficiently cool. We find that when it comes to DIY network gear and routers, there are two approaches. Either create your own bespoke solution that perfectly fits your needs, like this perfect home router, or work around your current gear and build some tech to automatically reboot it for you. Need a NAS? The Helios4 is built around the Marvell Armada 388 SoC and has four SATA ports, making it a great way to connect a bunch of hard drives to a network. This is the second run from the team behind the Helios, and now they’re looking to take it into production. A while ago, [Dan Macnish] built Draw This, a camera that takes an image, sends it through artificial intelligence, and outputs a cartoon on a receipt printer. It’s a camera that prints pictures of cartoons. Of course, some people would want to play with this tech without having to build a camera from scratch, so [Eric Lu] built Cartoonify, a web-based service that turns pictures into cartoons. Grafitti is fun to spell and fun to do, and for all the proto-Banskys out there, it’s all about stencils. [Jeremy Cook] did a quick experiment with a 3D-printed spray paint stencil. It works surprisingly well, and this is due to leveraging the bridging capability of his printer. He’s putting supports for loose parts of the stencil above where they would normally be. The test sprays came out great, and this is a viable technique if you’re looking for a high-quality spray paint stencil relatively easily. Readers who took part in the glory days of custom PC building will no doubt remember the stress of having to pick a case for their carefully-curated build. You may have wanted to lower the total cost a bit by getting a cheap case, but then you’d be stuck looking at some econo-box day in and day out. Plus, how do you post pictures online to boast about your latest build if there are no transparent windows and a lighting kit? While some may have spent more time choosing their lighted case fans than their optical drive, [Miroslav Prašil] was surely not one of them. When he decided to build a new NAS for his home network, [Miroslav] decided he wanted to put all his money into the device’s internals, and house his build in a wooden storage crate from IKEA. While the low cost was certainly a major factor in the decision, it turns out the crate actually offers a decent amount of room for hardware components. As an added bonus, it doesn’t look completely terrible sitting out in the living room. In a detailed series of posts on his blog, [Miroslav] walks us through the entire process of building what he has come to call the “NAScrate”. Wanting gigabit Ethernet and a real SATA controller, [Miroslav] went for the ASRock C70M1, a Mini-ITX board with integrated dual-core AMD processor. While not exactly a powerhouse, it will certainly wipe the floor with the fruit-inspired single board computers that so often dominate these types of builds. To get his clearances worked out, [Miroslav] rendered the entire build in OnShape, which gave him enough confidence in his design to move on to actual construction. 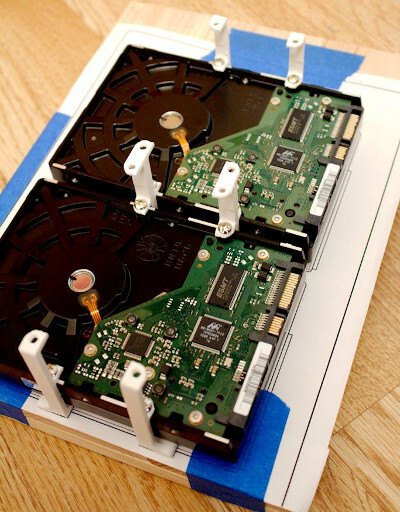 The build involves several 3D printed parts, most notably some clever hard drive mounting brackets which allow the drives to be stacked into a space-saving arrangement while still leaving room for airflow between them. [Miroslav] deftly avoids any religious debates by leaving off his particular choice for software and operating system on his newly constructed NAS, but he does mention that something like FreeNAS would be a logical choice. While this may be the first wooden one we’ve covered so far, home servers in general are a favorite project for hackers, from budget-friendly scratch builds all the way up to re-purposed enterprise hardware. You’re likely aware of the protests and demonstrations happening throughout Venezuela over the past few months, and as it has with similar public outcries in recent memory, technology can provide unique affordances to those out on the streets. [Alfredo] sent us this tip to let us know about riotNAS: a portable storage device for photos and videos taken by protesters (translated). The premise is straightforward: social media is an ally for protesters on the ground in these situations, but phones and cameras are easily recognized and confiscated. riotNAS serves up portable backup storage via a router running OpenWRT and Samba. [Alfredo] then connected some USB memory for external storage and a battery that gives around 4 hours of operating time. For now he’s put the equipment inside a soft, makeup-looking bag, which keeps it inconspicuous and doesn’t affect the signal. Check out his website for future design plans—including stashing the device inside a hollowed out book—and some sample photos stored on the riotNAS system. If you’re curious what’s going on in Venezuela, hit up the Wikipedia page or visit some of the resources at the bottom of [Alfredo’s] site.